The rule books for the Junior Olympic gymnastics program and for the Xcel gymnastics program were updated for the new quadrennium (2018-2022). Most of the rules and values of skills stayed the same but there are some changes. 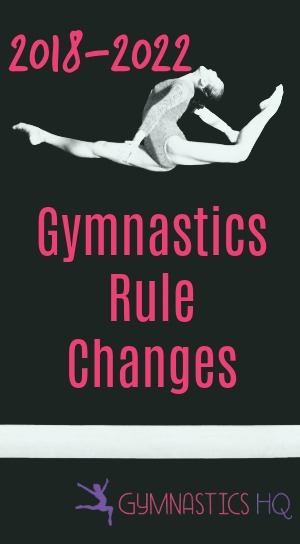 I have outlined some of the biggest changes below that will affect gymnasts and coaches. GymnasticsHQ’s Skill Progression Charts have been redesigned and updated to reflect the changes in the rules. One of the biggest changes to the rules for 2018 is the addition of new vaults. It’s obvious that USA Gymnastics is trying to encourage vaults different than just the handspring vault. They have added a new Tsukahara progressive vault to Xcel Silver, and 2 additional “timer” vaults as Level 6, 7 Vaults. Previously these vaults would be done as progressions to learn the bigger skill, but not competed. Now with gymnasts able to compete them, they can spend more time mastering these progressions. Vaults 1 & 2 will have very different rules for the execution of them than we have seen before. Judging of the vault will end when the gymnast’s feet hit the mat stack. The exception to this is if the gymnast under rotates and steps towards the table, those steps will be a deduction. If the gymnast has a lot of power and steps away from the table, no deduction will be taken. Any movement backward (backward roll, backward steps, fall to the back) is OK and will not receive deductions. The gymnast just must return to a stand and salute the judge. Another change is that now a split leap can be a “B” on beam. In order for it to be a “B,” the gymnast needs to have completely straight legs. So now both a split jump and a split leap are “B”s on beam. Before the split jump was a “B” and the split leap an “A”. Level 6’s have to cast higher on bars. Now they must cast to a minimum of 45° above horizontal on bars to avoid deductions, whereas before it was just to horizontal. On Bars, they have to do a salto dismount. Before they just had to do an “A” dismount, so they could do either an underswing or sole circle. On Beam, Level 6’s now have to do either a non-flight acro series or one acro flight skill. Before they just had to do one acro skill (flight or non-flight). On Beam, Level 6’s now also have to do an aerial or salto dismount. Before they just had to do an “A” valued dismount. In their 3 skill acro series on Floor, there have to be 2 skills with flight. Before there was no requirement for flight. 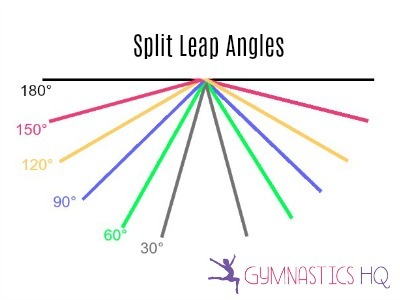 On beam, Xcel Gold‘s must do a split leap or jump with a minimum of a 120° split instead of the 90° that was required previously. The deduction used to be a flat .1 for each concentration pause before difficult skills or connections of more than 2 seconds. Now if you pause for 2 seconds the deduction will be .1, if you pause longer it will be .2. In an effort to reward gymnasts that do harder skills, the composition requirements for Level 8, 9 and 10 got more specific. Previously the .2 deduction for not performing skills up to your competitive level was vague and up to the judges’ discretion. Now it is specifically spelled out in the JO Code of Points. For example, as a Level 8 on beam, you need to do an acro series with 2 “B” flight skills and two additional acro skills with one of them a “B” acro skill to not receive any deduction. If you only do 2 additional acro skills but both of them are “A”s, or you do just one additional acro skill that is a “B,” you will get a .05 deduction. Coaches will really have to pay more attention to the skills they put in Level 8, Level 9 and Level 10 routines to ensure the gymnast doesn’t get composition deductions. Gymnasts will have to make sure they can do enough difficult skills to go in their routines to not receive these deductions. In another move to reward gymnasts that do more difficult skills, Level 10’s can earn a .1 bonus for doing very difficult skills that is not included in the start value. So while the max score a gymnast can receive remains a 10.0, this will help gymnasts that do harder skills earn higher scores. The additional .1 bonus can be earned on vault by doing harder vaults that have a .1 bonus value. On bars, beam and floor, gymnasts can earn this .1 bonus for connections and for performing “D”/”E” valued skills. Those are the bigger changes that were made in the rules for the new 2018-2022 quadrennium. For more information about the skills you need in your routines, you can check out the level requirements and my skill progression charts. Thank you for posting this information. But where can I find what some of them gymnastics terms mean? For example, Salto dismount or non flight acro series. Preferably in video sample form. You can look up some of the terms in my glossary https://gymnasticshq.com/glossary-of-gymnastics-terms/ . I’m not sure about video (maybe youtube?). The salto dismount means it has to be a flipping dismount and the non flight acro series means 2 (or more) acro elements that are connected, but they don’t have to have flight. So for that backwalkover backwalkover would work. Thanks for posting now I know what to do at gym I thought it was 90o for gold now it’s 120o thanks!! Thanks so much, this was very helpful!!! I think you have a correction to make. On the new silver vaults, #2 indicates feet will be facing away from the mat, when they should be facing toward the mat according to the new code of points. It’s not a 1/2 on-1/2 off, it is just a “round off.” But thank you for posting this. It is easier to share with my team parents than having to write it up myself! I’m starting gymnastics in a few days and I can tumble but I’ve never done other events, any advice?? Where could I find a list of skills and their values? Here you state on beam in level 8 the new requirement is for acro series with 2 B flight skills but on your level 8 skills chart/requirement page you state the beam requirement to be a series requiring only 1 B with flight. Can you please clarify what the new acro series requirement will be for beam level 8. The series requirement (special requirement) is the one series with 1 “B” flight. The composition requirements got harder if you don’t want to get a deduction for your acro not being up to the competitive level. These deductions are much smaller like I mentioned up to .2. The special requirement if you don’t do it is 5 tenths. Hopefully that clears it up….special requirements vs. composition up to competitive level.